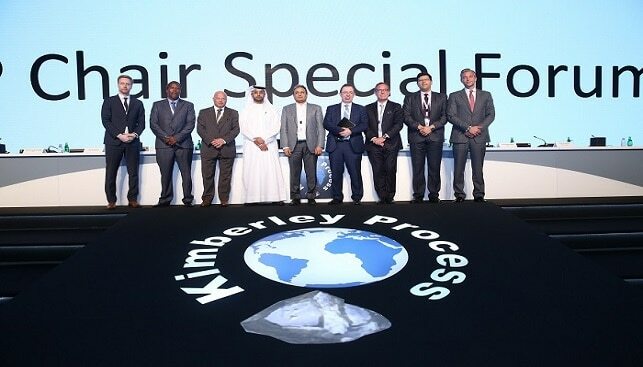 The Kimberley Process rough diamond certification scheme has 54 participants, as well as a number of observers. Observers are diamond industry and civil society groups that play an active role in monitoring the effectiveness of the scheme, as well as providing technical and administrative expertise. The 54 participants account for approximately 99.8% of the worldwide production of rough diamonds. The European Union and its Member States count as a single participant, meaning that the KP represents a total of 80 countries. KP Observers include the Diamond Development Initiative, the World Diamond Council, the African Diamonds Producers Association, as well as Civil Society Coalition Partners. Civil Society Coalition Partners consist of the Groupe de Recherche et de Plaidoyer sur les Industries Extractives (GRPIE), Cote d’ivoire, Centre du Commerce International pour le Developpement (CECIDE), Guinea, Green Advocates, Liberia, Network Movement for Justice and Development (NMJD), Sierra Leone, Ruseau de Lutte contre la Faim (RELUFA), Cameroon, Centre National d’Appui au Developpement et a la Participation Populaire (CENADEP), DR Congo, Groupe d’Appui aux Exploitants des Ressources Naturelles (GAERN), DR Congo, Zimbabwe Environmental Lawyers Association (ZELA), Zimbabwe, Center for Natural Resource Governance (CNRG), Zimbabwe, Bonn International Centre for Conversion (BICC), Germany and Partnership Africa Canada (PAC), Canada. Current applicants to the process (states that have expressed their commitment to the Kimberley Process but have yet to meet the minimum requirements of the KPCS) include: Burkina Faso, Chile, Kenya, Mali, Mauritania, Mozambique and Zambia.